The South has long been a hotbed of racism. I don’t think this is news to anyone. It has a terrible history with issues of race, the raw wounds of which continue to bleed into its present. And there’s no shortage of novels, tv shows, and movies that focus on this still rampant racism. 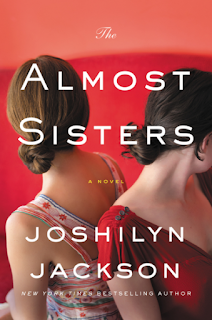 Joshilyn Jackson’s latest novel, The Almost Sisters, tackles this issue from the inside and is told with Jackson’s signature humor, eccentric characters, and unpredictable plots. Leia Birch Briggs is a famous comic book artist. She is well known for her creation, Violence in Violet, and has signed on to write a prequel for this fan favorite, the origin story for Violence, a bloody, destructive, and vengeance minded character. At a Comic Con where the prequel is announced, Leia has a drunken one-night stand with a fan. She doesn’t remember his name, calling him Batman, for the costume he wore in the bar where they met and her major recollections of him are of his eyes and his smile and the fact that he’s black. When it turns out that she’s pregnant from this encounter, she makes peace with the fact that her child, who will be biracial, will not have a father, because how do you locate a stranger in a costume whose name you don’t know? Her bigger concern is telling her family that she’s pregnant and unwed. But just as she works up the nerve to do that, the lives of those she loves go to hell in a handbasket. Perfect step-sister Rachel kicks her husband out. Niece Lavender witnesses her parents’ ugly blow-up. And even more concerning, Leia’s ninety year old paternal grandmother Birchie, who she spent every summer with as she was growing up, causes a very uncharacteristic scene in church, a clear sign that something is not right with her. Swallowing the secret of her pregnancy, Leia hightails it to Birchville, Alabama, to the town that her family founded, to uncover what is going on with her beloved Birchie. What she eventually uncovers shows her a side of this small Southern town that she has never seen before and which makes her question the reality her unborn child will face, especially in the South. As is usual in Jackson’s novels, there is a great deal of humor and kookiness on display here. Most of the characters are richly drawn and balanced in their characterizations. Birchie and her best friend and companion, Wattie, are wonderful. Rachel and Lavender are very real, flawed and good-hearted both. The biggest contradiction to the idea of fully fleshed out characters is Batman himself. He’s certainly unknown while Leia herself remembers nothing about him but as he is revealed to her, he stays a rather flat character to the reader, only as a real as a superficial Facebook profile is. The novel has a multitude of storylines, corresponding to the multiplicity of secrets the characters hold, and sometimes they tangle around each other. Other times they complement or mirror each other and add to the complexity of the issues weaving through the novel. Just as Leia is trying and struggling to discover the origin story for Violence, she is discovering the sometimes hidden, and not always pretty, origin stories of the town, its families, and her family in particular. The novel flows easily and the story is just the kind of zany that Jackson’s readers have come to expect but there are a few sections, mainly when Leia starts musing to herself, where it becomes heavy-handed, bordering on preachy about racism in the South. In fact, it’s strange that as smart as Leia is, she never noticed the dichotomy of the two different Souths before she got pregnant with Digby. Call it an oddly belated awakening. Over all though, this novel is a nutty and engaging romp of a story. Jackson’s fans and readers who like solving old mysteries, enjoy offbeat stories and quirky characters, and want a little more substance to their beach reads will enjoy this funny, disturbing, and eminently readable novel. For more information about Joshilyn Jackson and the book, check out herwebsite, like her on Facebook, or follow her on Twitter. Check out the book's Goodreads page, follow the rest of the blog tour, or look at the amazon reviews for others' thoughts and opinions on the book. I just reserved a copy of this audio book at my library - it sounds SO good! I'm glad to see how much you enjoyed it.